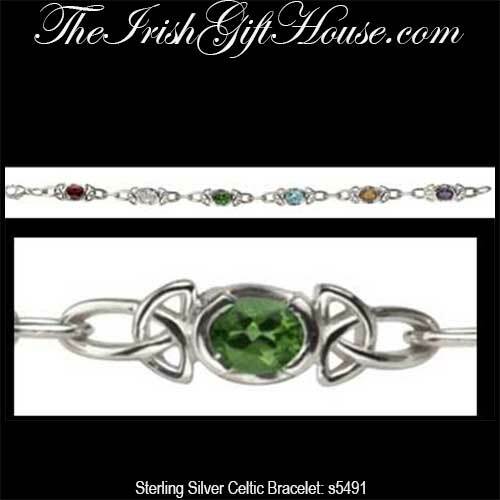 Sterling silver Celtic bracelet features six Trinity links that are enhance with semi precious stones. This sterling silver Celtic bracelet features six double Trinity knot links with each link enhanced with one of the following semi precious stones: garnet, white topaz, peridot, gold topaz, aquamarine and amethyst. The Celtic bracelet measures 3/8" wide x 7 1/2" long and is complete with a lobster claw catch. The Trinity bracelet is crafted by Solvar Jewelry in Dublin, Ireland and it is gift boxed with a Celtic knot history card, complements of The Irish Gift House. Sterling silver Celtic bracelet features a rectangular design with knot-work connecting links. Sterling silver Celtic bracelet features teardrop shaped links that accommodate the iconic Trinity knot.